How about adding a little extra safety and style to your Can Am Spyder with a set of Contoured Amber LED Marker Lights to replace the reflectors. 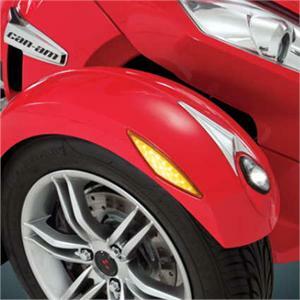 These marker lights are thicker than OEM and contoured to better match the lines of the front fender and can be wired as either running or running and turnsignal. With 16 LED’s per side safety is markedly improved by being more visible and putting a turnsignal on the side. For original style Can Am Spyder front fenders (see above picture). Sold as a pair. This set fits all models with original style fenders. Shown above installed on our own Spyder RT (Blue). We have ours wired as Running and Turn Signals. Looks great and adds a lot of light on the side. Wiring into your existing harness is required. If running these Amber LED Marker Lights in Parallel with the Mirror LED Turn Signals then you will need to Install the Full LED Illumination Modules with Blinkers to supply an input to these Amber LED Marker lights. When trying to use two or more LED Lights in parallel with your normal Turn Signal lights you will get fast and possible erratic flashing. If using these Amber LED Marker Lights with the Illumination with Blinker Modules then you will only use the Running Light input.